This entry was posted in Product Innovations on April 16, 2012 by Customer Service. 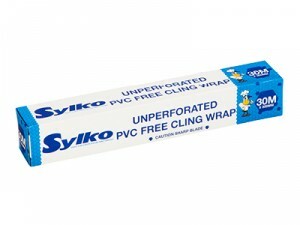 At Sylko, we try to innovate new ways of packaging our products. For example, we have added a special “restart” strip onto our clingwrap box, and have also added a “roll holder” in either side. The restart strip grabs the end of the clingwrap when you have finished tearing, making it easier to get off the roll the next time. The roll holders help to grip the roll as you are pulling the clingwrap off the roll.